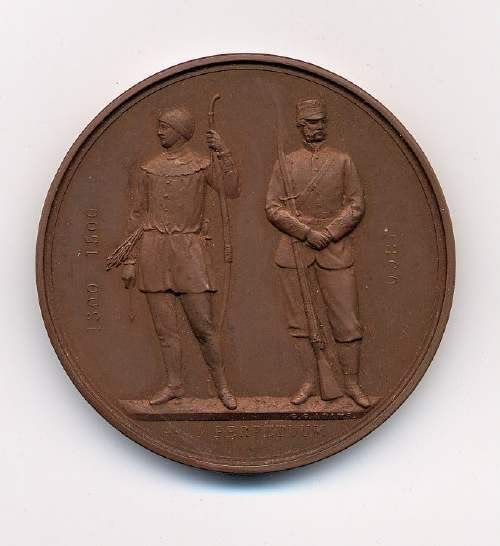 Circular bronze medal (a) with the emblem of the National Rifle Association on one side - two figures, one holding a bow and arrow, the other a rifle - with the motto SIT PERPETUUM and dates 1300 1500 beside the bowman and 1860 beside the rifleman. On the reverse is a laurel wreath with THE NATIONAL RIFLE ASSOCIATION 1860 in the centre. The medal fits into a square presentation box (b), which is covered in brown paper. The base of the box is lined with purple velvet and the lid with cream silk stamped with the name of the maker C C ADAMS SCULPTOR LONDON..
Part of the Robert Mackay collection. How many people would have such a medal like the one above. Should I consider insuring it? Hi, I also have one of above medals which belonged to my grandfather. I have just found it in a draw, I have not seen it for a few years. It's in perfect condition. The Astor County Cup continues to be a rifle shooting competition. Founded by Astor of the publishing family who gave the cup and funds to purchase the Astor tankards. The country is divided into areas. Rifle clubs in each area compete for the small bronze medals. The winning team in each area shot the final for the main trophy at the Imperial Meeting at Bisley each July. Teams of 8 shot at 300/500/600 yds. 7 rounds at each. The winners receive larger silver medals which have the trophy on the reverse in place of the tankards. Unfortunately the bronze medals are quite common as the match started in the early 20th century and turn up on a regular basis on ebay etc. ~ Many thanks for the information. ~ Administrator.